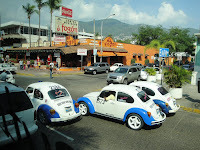 While Acapulco, Mexico, may have once been a romantic place to spend a honeymoon or ta ke a romantic getaway, we found the city itself to be less than what we would consider a place to rekindle the flames of romance. Perhaps the resort areas a bit away from the downtown are a little nicer but after our first experience in Alcapulco several years ago, we opted to get out of the city and do something a little different than fend off vendors and avoid the areas that were heavily patroled with machine gun armed personnel. Our ship's excursion took us about an hour out of town and to another area less developed, with a huge beach area hopefully protected from too much development as this is where two species of marine turtles lay their eggs. Mexico is home to seven of the eight species of marine turtles in the world and the Acapulco area is privileged to have two of those species, the Loggerhead (Golfina, the Spanish name) and the Leatherback (Lute). Our mission was to release newly hatched turtles into the sea. 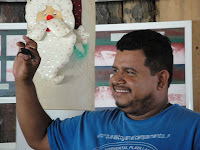 We arrived at a small compound (Campamento Tortuguero Manejo Ambiental Playa Larga) consisting of several shaded areas on the beach and a small restaurant with a small living area behind for the director of the operation, Victor Verdejo. Our tour guide did the lecture part of our experience under the guidance of Verdejo telling us about the turtles, the effort to save them from extinction, and the operation of the facility. Basically it is a one-man operation. 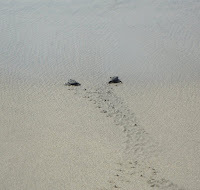 Verdejo goes out and collects the turtle eggs during the season, The turtles, depending upon species, lay an average of 110 eggs per nest which is then covered with sand. 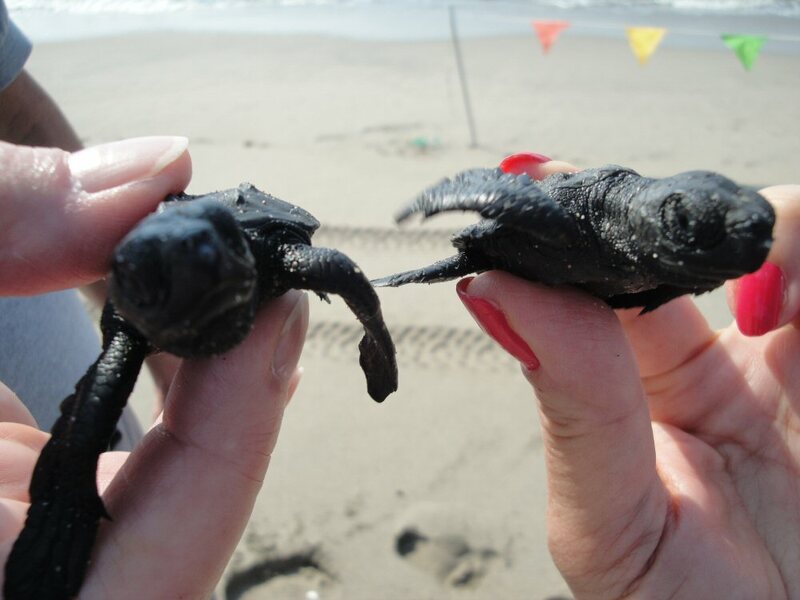 These are collected as soon as the female returns to the sea and reburied in a protected area in the compound. Each new nest is labeled with the species, date, and other pertinent information. 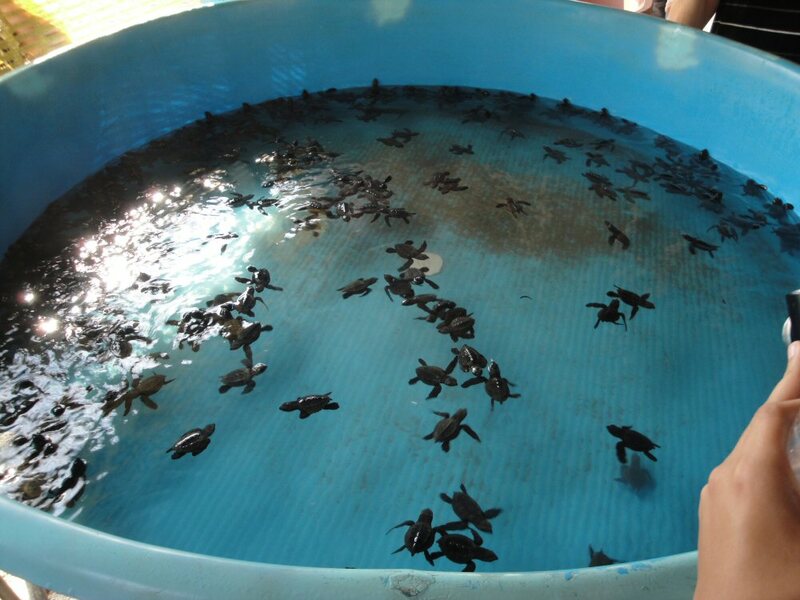 As the turtles hatch, usually within 45-60 days, they wiggle their way to the surface of the sand and are then collected and placed in a large shallow tank of water for a few days before release. Verdejo says he does n ot feed them because they will not want to go into the ocean for food if food is available to them on shore. 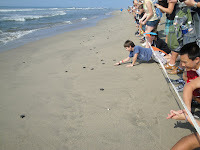 When the tour guide finished the lecture and showed the group how to carefully hold the baby turtles so as not to harm them, we were led to a flagged area along the beach near the water's edge and each handed a squirming turtle anxious to get along with his/her life. We were asked to name our turtles. Bob called his Fred and I named mine Harry. They may have been Fredricka and Henrietta for all we knew. 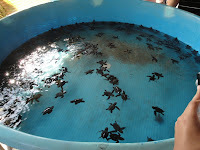 At the count of three, we all placed our turtles down and watched them scurry into the water. They looked so helpless. And as we watched, I remembered the statistic that was given. Only two out of 100 will probably survive due to predators and the other dangers that awaited them in the ocean. It was amazing to see them disappear in the surf and then see them bob to the surface, their tiny heads almost undetectable in the glistening waters that carried them further away. It was a long bus trip for a short few moments of delighting in one of nature's wonders but it was so worth the effort. 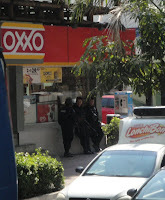 Upon our return to the busy traffic-laden city of Alcapulco, we drove through several areas where we saw groups of military personnel with automatic weapons and one that had a truck with a machine gun mounted on it with a belt of ammo looped through it. 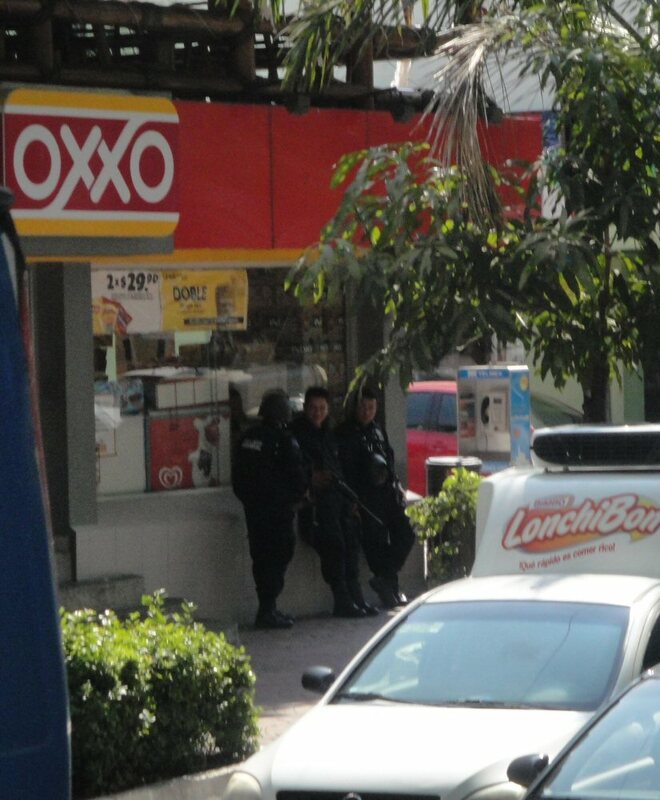 Very unnerving for those of us not used to seeing those kinds of things on our streets. 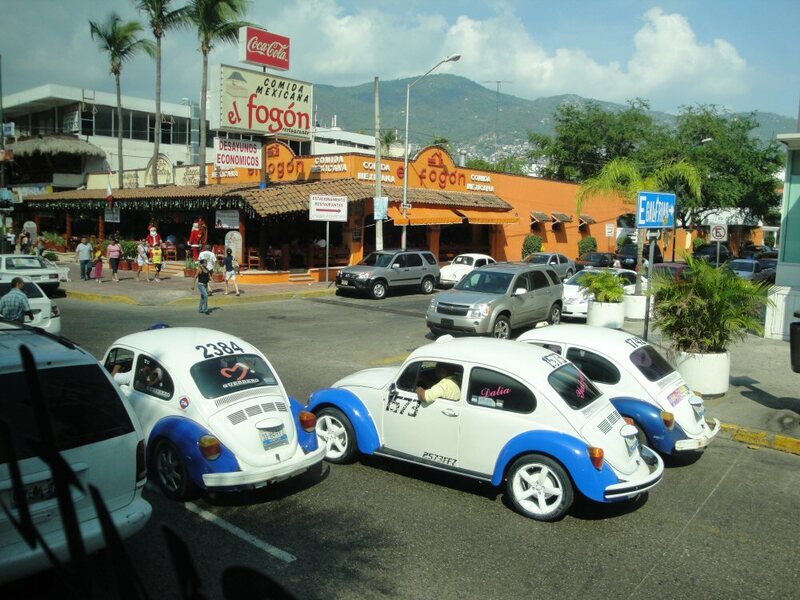 We also marveled at all the VW bugs that were used as taxis often with a homemade luggage rack on top. Ooooo! You're braver than I am going to Mexico! 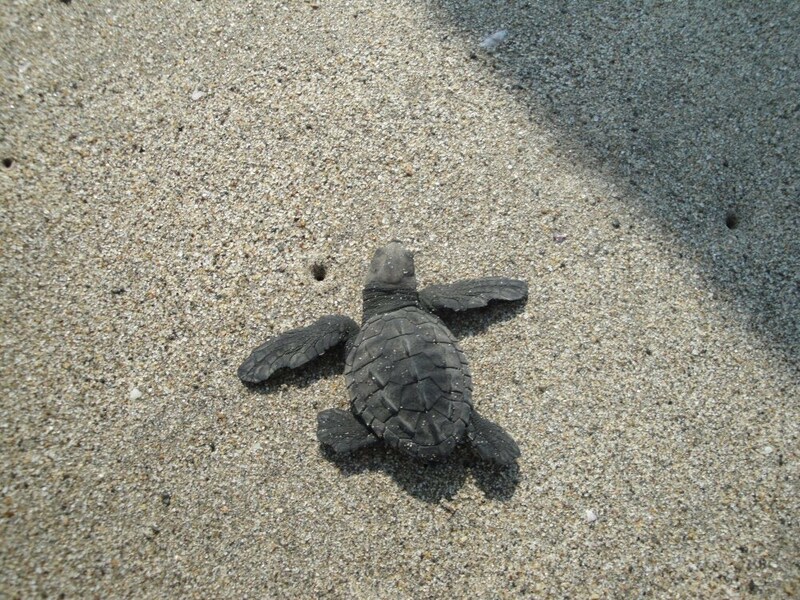 :) I love the turtle story. So super good doing something great like that. Not so brave, Caroline. We visited by way of cruise ship. Usually a safer way to see things you're not too sure of. What a wonderful experience! I would love to do something like that with the kids, especially Danielle. With all the horrible stories in the news lately, kind of doubt Acapulco will be a vacation destination for our family, though. (Plus, Danielle would probably want to keep him.) Glad you guys got to experience this! I kept thinking of Danielle the whole time we were there. There must be other places that do releases. 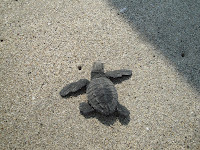 I know we were on a beach in Fl in July where they were marking turtle nests. I'm sure there's some programs around. They are soooo cute! What a great experience! Danielle said "He's very cute but that's not fair." :) Tyler thinks the turtle's legs look like lettuce. The legs were more like paddles they were actually pretty thick and felt like a leather belt. I'm assuming Danielle was worried about their survival. 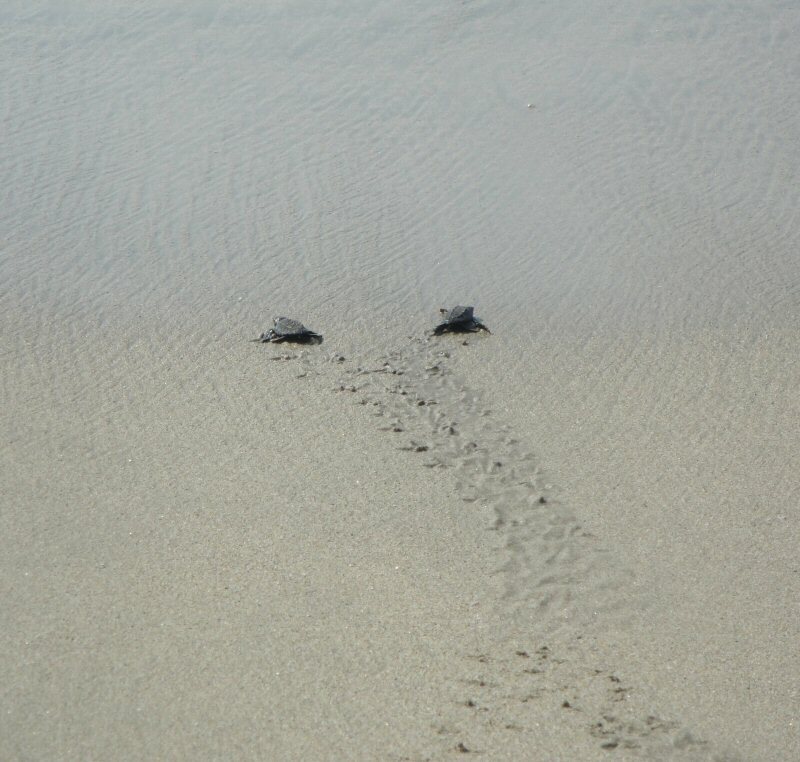 At least this batch of turtles didn't have a bunch of bird waiting to swoop down on them.